Poster calendar printing is a convenient and attractive way of making your brand visible. Poster calendars are a much-appreciated giveaway, especially during the holiday season. They make a good alternative to custom posters as a decoration, with the added benefit of being a functional calendar as well. Another big plus is that unlike most other promotional materials, poster calendars will keep making brand impressions for a whole year. Our poster size calendars are offered in popular standard sizes. Custom sizes can be ordered as well if you need them smaller or larger. We offer paper and cardstock options in matte and gloss finishes as well. To get started, download free poster calendar templates to allow you to print poster calendars with all the right dates, layout, and orientation. The template also lets you account for the bleeds and safe zones, letting you create more accurately trimmed calendars. UPrinting also has an online design tool, making it easy to make a custom poster calendar for any application. To learn about more customization options, contact us. 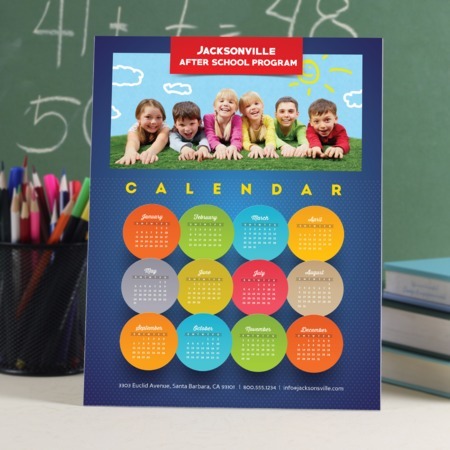 At UPrinting, calendar printing options are customized starting with the materials. You can choose between 100 lb cover and 100 lb gloss text stocks..